The new Centegra Hospital-Huntley, which opened this past August, was the product of many years of thoughtful planning and design. It was a frigid winter to do anything outside – let alone examine the shell of a new building. But Sheila Senn and her colleagues at Centegra Health System spent a lot of time in the cold during the early months of 2015, as they oversaw construction of a new hospital in Huntley. There they were, surrounded by concrete and steel in a building less than half complete, braving the elements in parkas, hats, gloves and warm boots. This intense attention to detail provided the backbone for this new hospital’s design, and took into account the needs of patients, visitors and staff members. “One of the nice things about the development of this building’s design is that, from the beginning, we had our associates and clinicians involved, so that we have something that works in the most efficient manner possible,” Senn says. 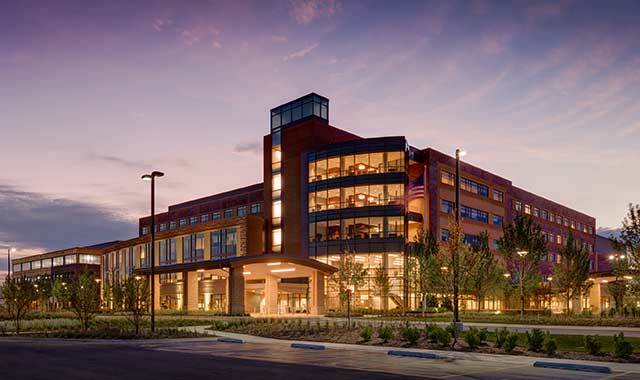 The result is a 384,135 square-foot hospital that’s outfitted for a modern health care environment and designed to evolve with the changing needs of the Huntley marketplace. Officially opened this August, the new hospital is only the third new hospital built in Illinois during the past 35 years. Its creation is the result of a business growth story: How an organization saw a market demand, staked a competitive advantage, outwitted its adversaries, seized opportunity and employed smart strategic planning for extending its brand. In 2005, McHenry County and its neighbors were in the midst of a population explosion. The villages of Lake in the Hills and Algonquin, in the southern part of the country, grew more than 25 percent between 2000 and 2010, according to the U.S. Census. Their neighbor to the west, Huntley, tripled in size. Just across the border, in Kane County, the story was the same. West Dundee grew 35 percent and Elgin 14 percent. Further west, tiny Pingree Grove exploded 3,000 percent. Hampshire nearly doubled. Hadley Streng and the strategy and development team at Centegra were watching the metrics and monitoring the activity at their hospitals in Woodstock and McHenry. Identifying a nucleus of activity around Algonquin, Lake in the Hills and Huntley, Centegra officials scouted for land and, in 2006, purchased 110 acres at Haligus and Algonquin roads in Huntley. Soon after, they sought state permission to open a medical office and immediate care center on the new campus. A new fitness center, which didn’t need state approval, was part of the plan. Through the recession and into the early recovery, Centegra’s leadership sensed a growing interest in hospital services. But in order to build that hospital, Centegra would need approval from the Illinois Health Facilities and Services Review Board. This agency monitors health care submarkets across the state and regulates facilities based on a number of criteria, including inpatient beds and population movements. In 2010, the state review board identified what Centegra had long suspected: McHenry and northern Kane counties had one of the state’s highest needs for inpatient beds. It was time to act. First stop: obtain from the state review board a certificate of need (CON). Like a business permit, this document allows a health care organization to add services according to community need. Centegra’s proposal wasn’t alone in targeting this region. In 2004, Mercy Health System, based in Janesville, Wis., sought permission to build a new hospital in Crystal Lake, at Illinois Route 31 and Three Oaks Road. That plan fell through, but was resurrected around 2010 – about the same time Centegra was submitting its proposal. At Centegra, Streng and the strategic planning team coordinated many of the steps involved with the state board application. Streng believes a few factors played into Centegra’s approval from the review board in 2012 – and the rejection of Mercy’s proposal around the same time. For one, Centegra’s justifications for the project differed from Mercy’s. The Huntley site also put Centegra closer to several health care customers, including young families and the senior community at Del Webb’s Sun City. Centegra CEO Michael Eesley believes the region’s tremendous outpouring of support also factored in. At a state hearing in February 2011, nearly 130 people spoke in favor of the hospital. Despite the high degree of local support, Centegra faced strong opposition from competing health systems. It wasn’t entirely unexpected, says Eesley, but it did require several years of continuing litigation. This past April, an Illinois appellate court verified Centegra’s state approval, settling the issue for good. Senn’s trips to the new hospital in winter 2015 were only a small part of Centegra’s strategic design of the new hospital. Experts including architects, project managers and construction firms lent their expertise in health care. Hundreds of Centegra associates, working across more than 30 teams, provided their own input. The general public also gave input. Focus groups at Sun City, community organizations and other public forums also provided critical feedback on the patient experience. Input from area paramedics and firefighters also led to some clever design work in the ambulance garage. Its three bays can each hold two vehicles back-to-back. The garage is attached to the emergency department for easy transit. Staff input also led to critical operational decisions and designs. Responding to this concern, the clinical staff in Huntley moves freely through a “back of house” area at the building’s core, something that Eesly likens to the vast underworld at Disney theme parks. Workers in departments like maintenance, food service, and the laboratory work on the lower level. Other staff can easily move from floor to floor inside the building’s central core. Each of the hospital’s five upper stories occupies a roughly similar footprint, so that staff can easily move from one department to another. The “front of house” area, where the public travels, is decidedly not the stereotypical sterile white hospital. Its walls are painted in warm, earthy tones. Its flooring incorporates warm tiles and sound-deadening imitation wood, even in patient rooms. The “back of house” area, where staff travels, uses different flooring and wall coverings – a clear signal that you’re behind the scenes. Nurses can access computerized patient charts inside each room, but just outside stands a computer station with small windows that allow for added patient privacy. Even the furniture was vetted, with attention paid to cleaning, patient experience and caregiver needs. The new building was designed not just for today, but for tomorrow as well. From the location on site to the layout inside, careful thought was given to any future expansion needs. Eesley says the building can easily accommodate a doubling or tripling in space without affecting operational design. This is possible by adding compartments adjacent to the building or by repurposing spaces in the hospital’s current footprint. When it’s fully functional, the new Centegra Hospital-Huntley is expected to employ as many as 900 people. So far, it’s already generated about 450 new jobs. About half of the new hospital’s staff is being transferred from existing Centegra locations. The jobs they’re vacating will be filled by new hires. In the weeks leading up to the August opening, team members were traversing the halls, learning their way around the new building in between training sessions. Some of these staffers, especially in the surgical suites, had been hired six to nine months earlier, so that they had sufficient experience ahead of the grand opening. Centegra’s human resources team vetted nearly 125 area physicians who applied for credentials at the new hospital. These individuals were entirely new to the Centegra system. When approved, they’ll also have permissions at the Woodstock and McHenry locations. “Some might get a delayed start, because we’re not going to let someone have privileges unless we’ve scoped them out,” says Eesley. Centegra Hospital-Huntley wasted no time welcoming the community on its Aug. 9 debut. Hours before it was set to open, teams were helping a young family to welcome a new child. The impressive five-story, 128-bed, all-private room hospital has a Level II Trauma Center, eight intensive care unit beds and a 20-bed Family Birth Center. Its pediatric unit enjoys a connection with the Ann & Robert H. Lurie Children’s Hospital of Chicago, whose physicians practice on-site. Next door, the newest phase of the hospital campus is taking shape. A new medical office building, expected to be complete next spring, promises to bring additional office space, a back and spine specialty center, and a unique training ground for future physicians. The new Rosalind Franklin University simulation center will bring students to Huntley to hone their skills in simulation pods. Looking back, Streng can’t imagine how the planning process might have gone any better. She’s impressed by the support from the Huntley area, Centegra executives and everyone else who shaped the project. She believes it’s that careful business planning and sharp focus on the target customer that made the difference. To other businesses looking to grow, she has one small bit of advice: take your time. Eesley is already dreaming of good things to come, and is excited to see how this hospital can serve its neighbors. This entry was posted on Monday, October 10th, 2016 at 12:00 pm	and is filed under Northwest Business Magazine, Top Posts. You can follow any responses to this entry through the RSS 2.0 feed. Both comments and pings are currently closed.